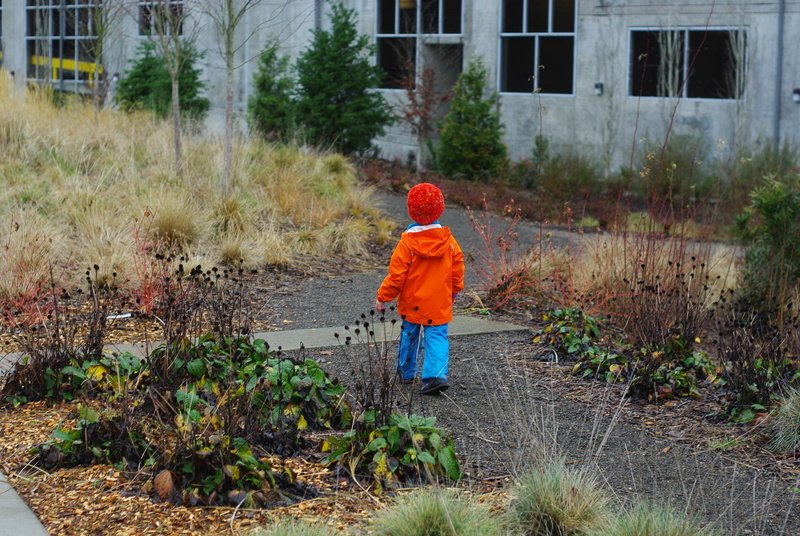 The week before Christmas, as part of our car-free week, we spent a morning in Redmond. The bike needed some work done, so I dropped it off and we set off on foot. 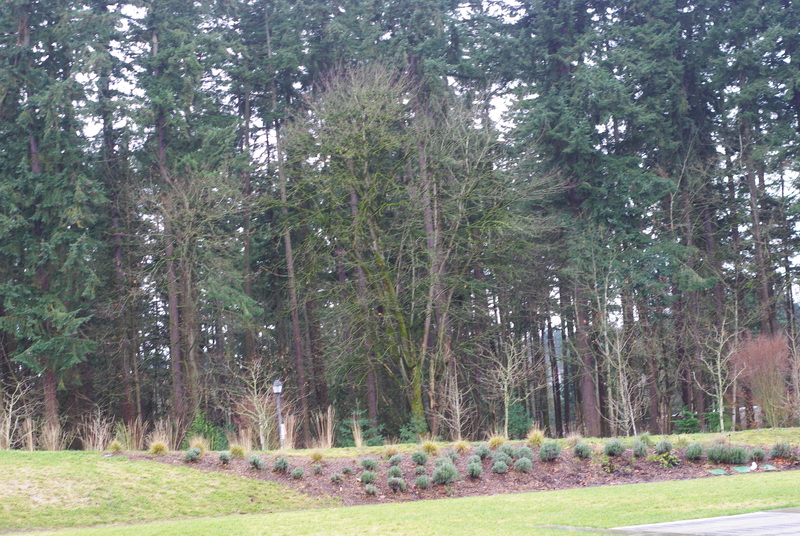 There’s a stand of trees in downtown Redmond, near Redmond Town Center, that I’ve been eyeing for years, but never stopped to check it out. Somehow, even on a bike it was too hard to stop. On maps it was colored like a park, and recently I’d seen it labeled on a map as the “Heron Rookery.” This day we were walking past it, so the exploring was easy. 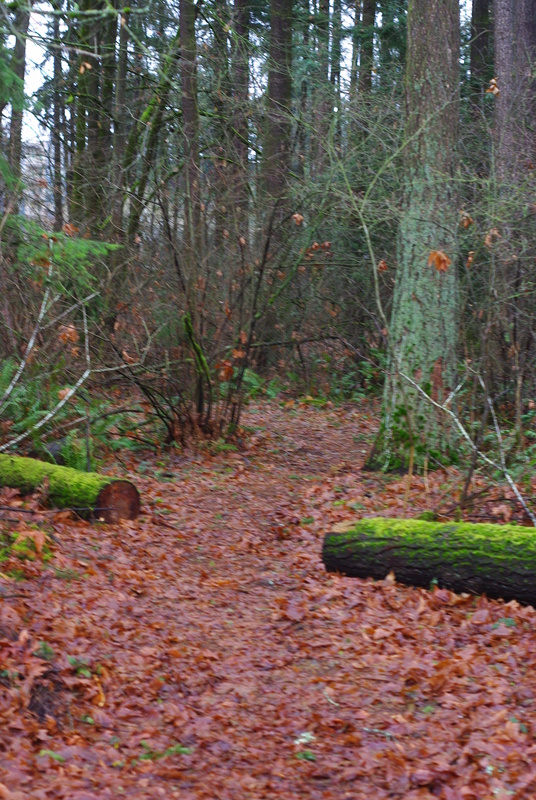 We found the path that I’d seen while biking past, and ventured in. It’s not very big, so it’s not very far. We found a large clearing (a former pond perhaps? ), completely deserted and hidden, and covered with leaves. 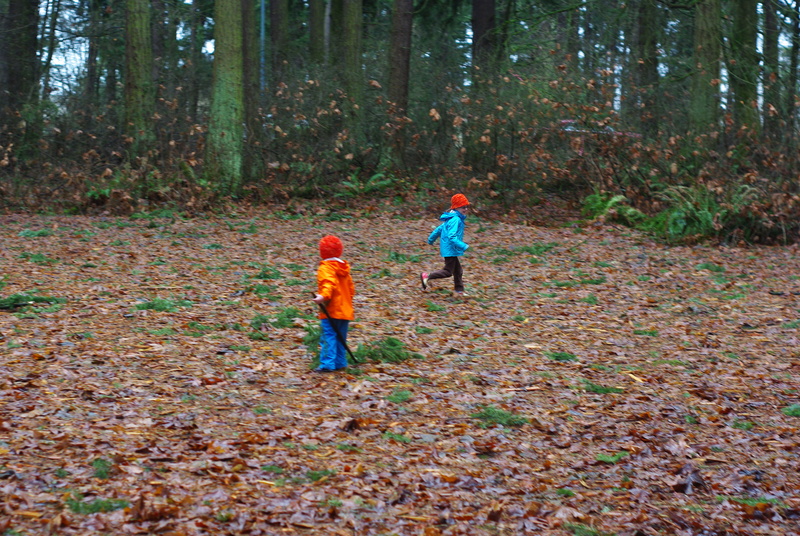 The kids found some sticks (as they always do) and ran around. Then it started to sprinkle, so we continued on to our first destination, Top Pot doughnuts (essential fuel for Christmas shopping). We stopped in at the new running store in Redmond, Super Jock and Jill, and then walked the Redmond Central Connector down to REI. 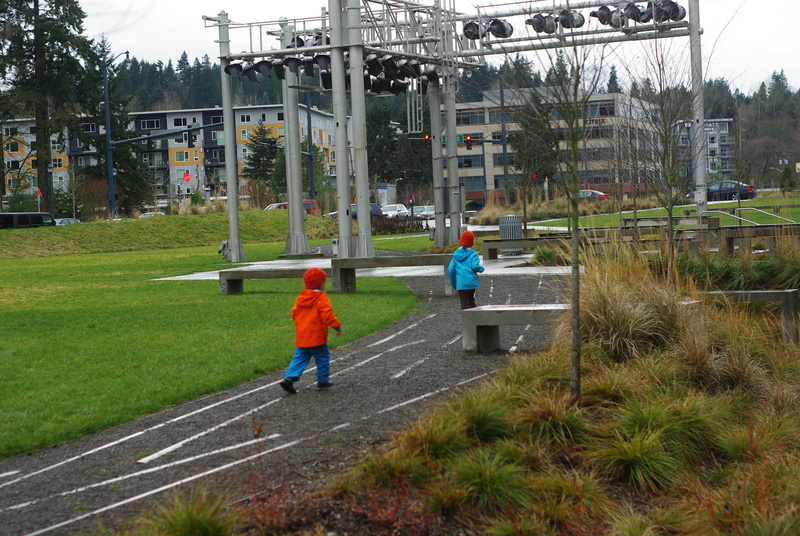 The Connector is a great place to walk with kids. There are plenty of side trails to run on and explore, and bench-looking structures to jump on. Too often we are in a hurry on the bike, but this day we were moving at kid pace. Then we went back to pick up the bike. And on the way we saw a Bullitt! In Redmond! He went the other way, and I wasn’t fast enough with the camera to get evidence. But I did get evidence of the traffic that we were not stuck in. It was naptime, so the babies went in the trailer. I think this was the first time they didn’t cry about it! The week before Christmas I had an appointment on Monday evening in a bike-unfriendly part of town. I went out to the garage to get in our family-hauler truck only to discover a dead battery. Fortunately, we had not yet sold our other car (anybody want a Honda Accord? Low miles! ), so I had a backup means of transportation. I’m not sure what I would have done otherwise – bike anyway? Reschedule the appointment? When I got back, Mark and I looked at the schedule for the week to figure out what to do about it. Now, many weeks we don’t drive, but we always have the truck as backup. This particular week I had no plans to go anywhere by car, and wasn’t really interested in jump-starting the truck only to take a special car-trip to charge the battery. So we arranged to borrow a car battery charger over the weekend, and went on with our week. Wednesday: We took our usual two bike trips to the church for catechism, then I took the boys Christmas shopping in Redmond. 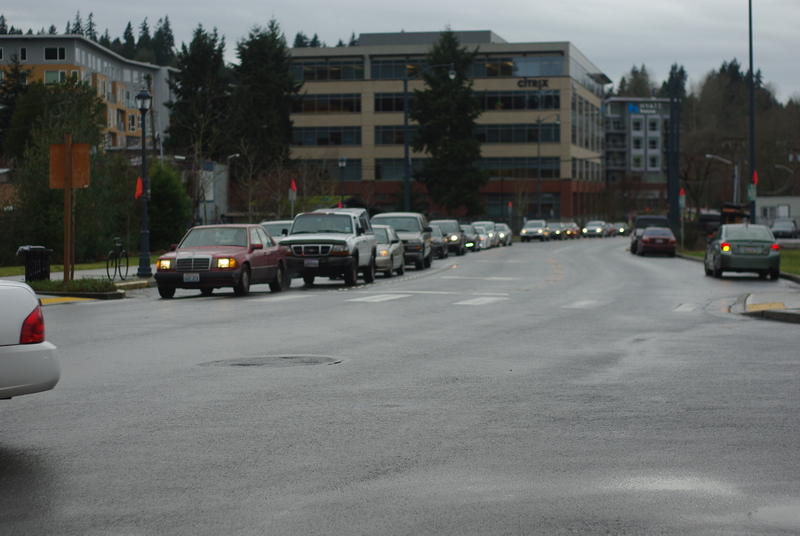 Thursday: We did more errands in Redmond (I felt like I was constantly in Redmond in the days before Christmas). Friday: We visited friends in Kirkland. Saturday: I don’t want to talk about it. 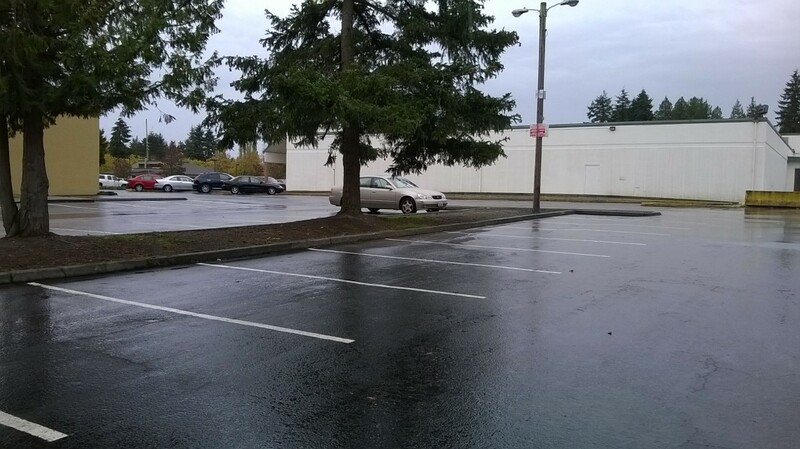 I went out with only the oldest (to Redmond, of course) and we took the car (doable with only one child, but not all four) because of rain and laziness and I regretted it. 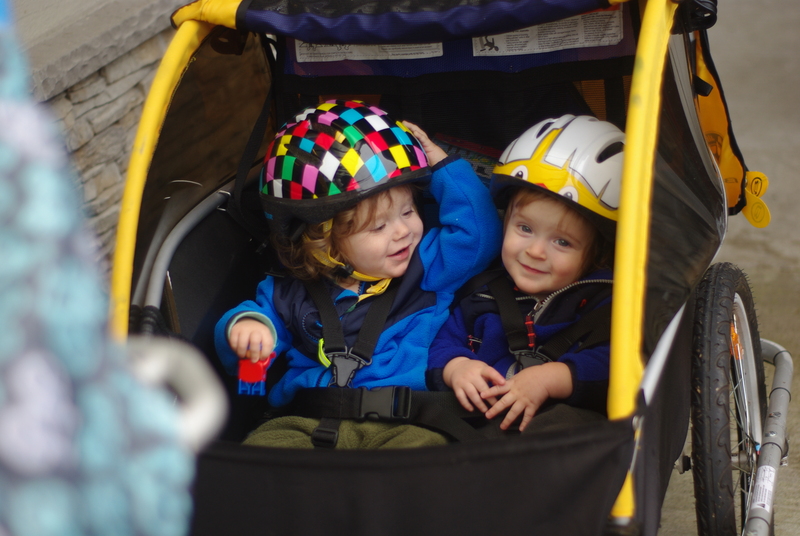 Sunday: We biked to church and then (battery charged!) drove to Seattle in the afternoon. Our carless week went as normal. We wouldn’t even have noticed the beached whale in the garage except that it was under the attic access where the Christmas supplies were stored so we couldn’t get at them! 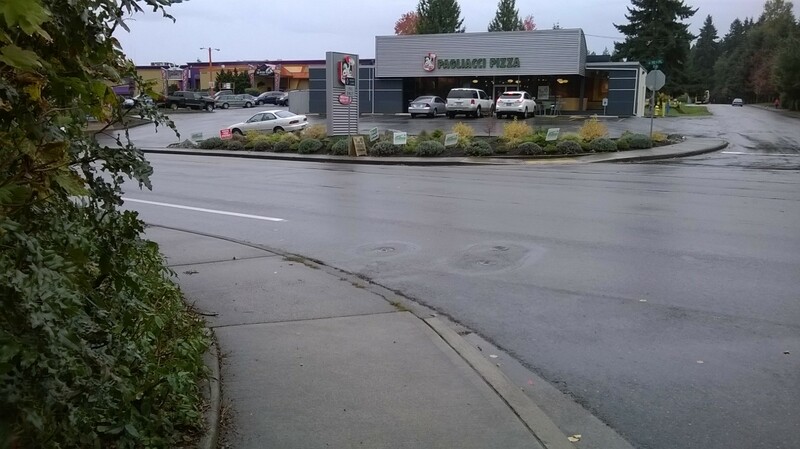 Strong Towns proposed a Walk to the Grocery Store Challenge. I highly encourage everybody to walk to the grocery store! 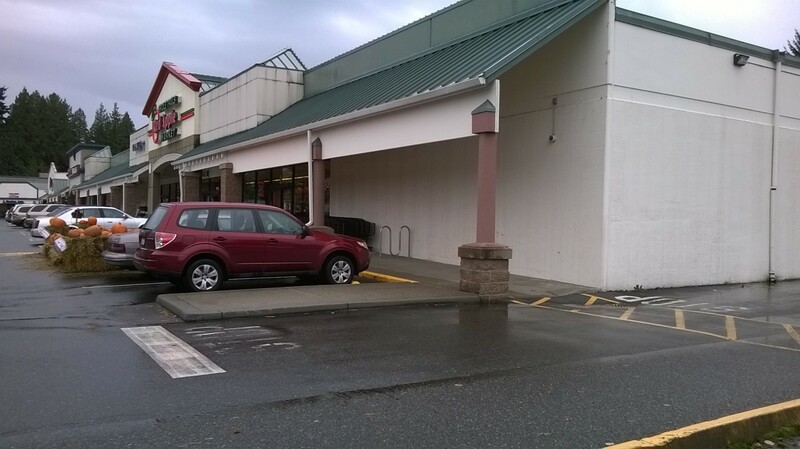 It’s not a challenge for us – we intentionally chose a walkable neighborhood – but I wanted to document our trip to the store anyway. 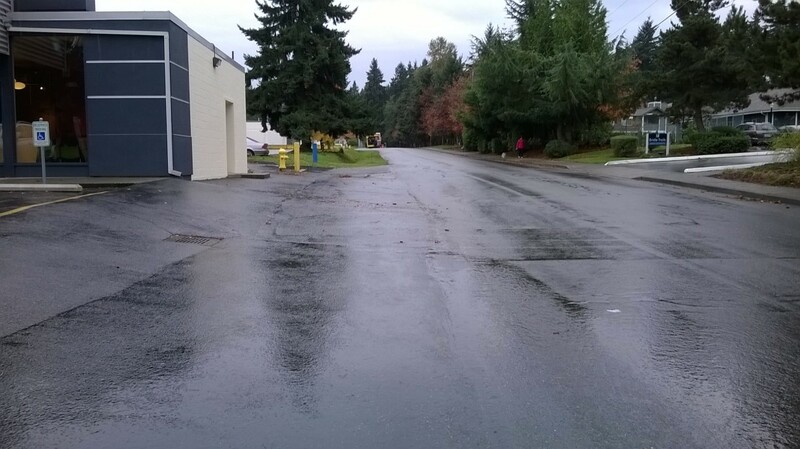 Here we have the obstacle, and it’s a big one – the crossing of NE 70th St, a minor arterial. This is the proposed Rose Hill Greenway that crosses here, and while it currently does not have a crosswalk, there is hope that when the greenway is built, the crossing will be improved. In the meantime, crossing it with four children and groceries is terrifying. We went at about 11am this time, which is less stressful than the late afternoon. I do not go to the store in the dark at all – I would need to walk blocks out of the way for a safe crossing. 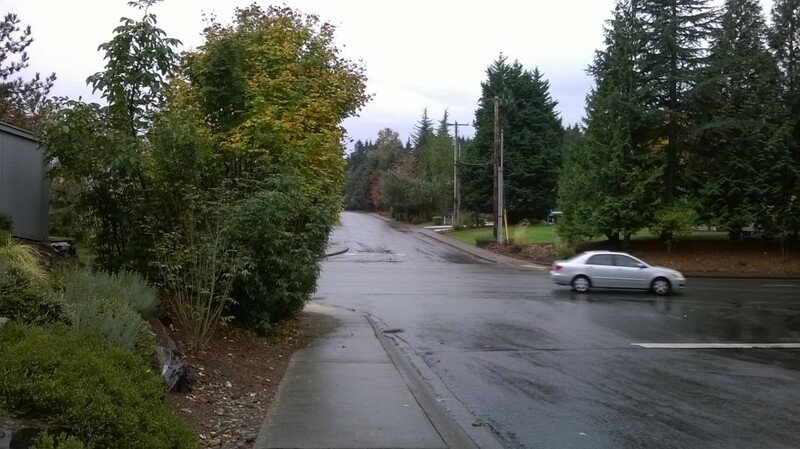 Approaching the intersection, based on where the curb cut is, this is the view I have when I push my stroller out into the street. 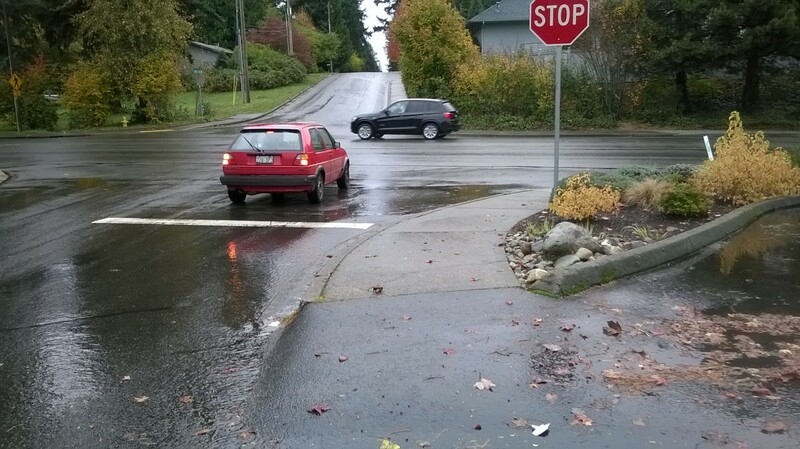 Some cars recognize the implicit crosswalk, but many do not. In the late afternoon most do not. I am not shy about asking drivers to stop by raising my hand, but many blow through that as well. 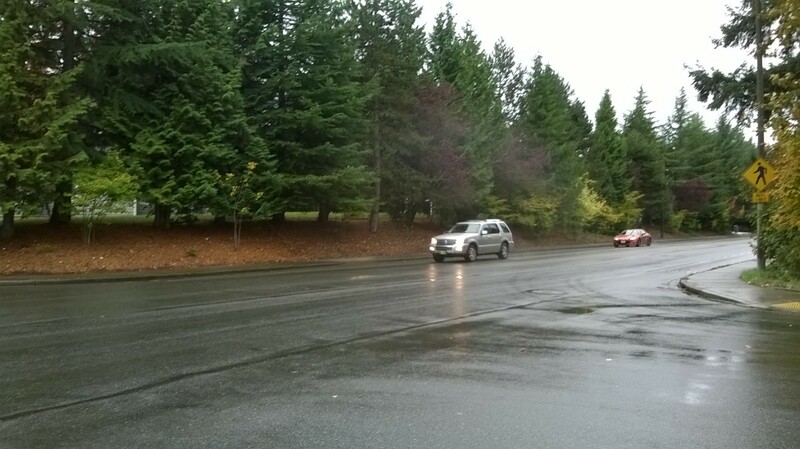 We wade out into the street, and when we get to the center turn lane, stop to ask the next lane of cars to stop… sometimes they do, and sometimes they don’t. My four- and six-year-olds know this routine well – they stay close behind me until we get to the other side. This particular trip to the store, the traffic was light, so we were able to get across without too much danger. and through the bowling alley parking lot. 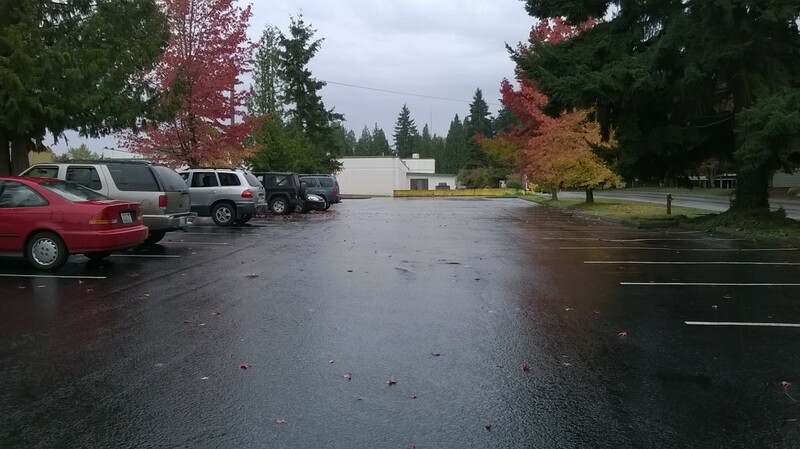 I confess that I haven’t been here for x-bowl in some time, but right now it sure looks like some of the parking lot could be used for something nicer. But in the meantime, we look at the trees, listen to the birds, and stomp in the puddles (the ones that are not oil slicks, anyway). When it’s clear, my kids like to look for contrails. This time it was raining, so no contrails, and no birds, but lots of puddles. We walk past the Green Beanery. 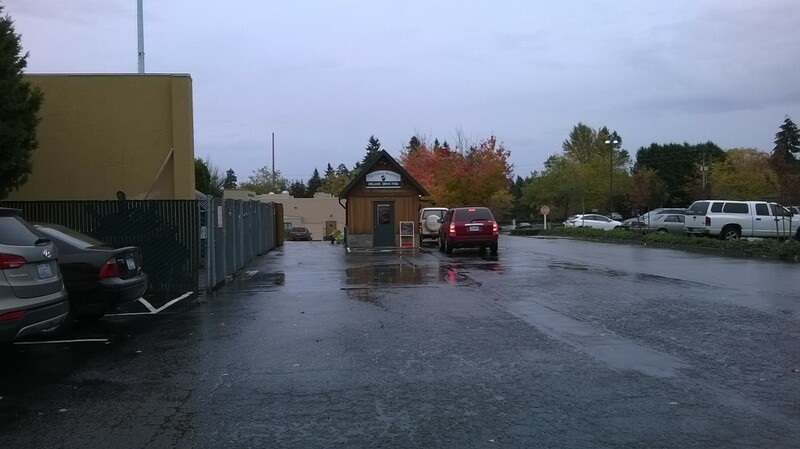 I scoffed at the Green Beanery when it first went in – organic drive-through! How sustainable could that possibly be? But there’s a walk-up/bike-up window on the left side. And here we are – Red Apple Market, our local grocer. we have arrived at the store! After shopping, I loaded up the second seat of the double stroller (there’s a baby on my back, too). 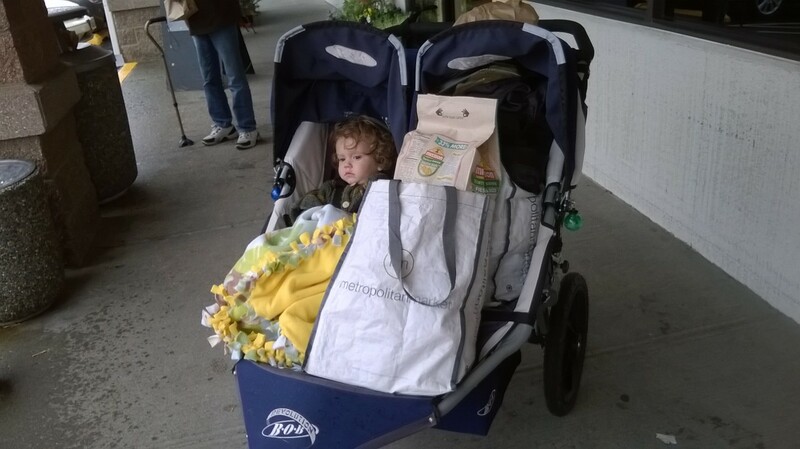 This was a bigger load than normal, but no problem with the stroller. 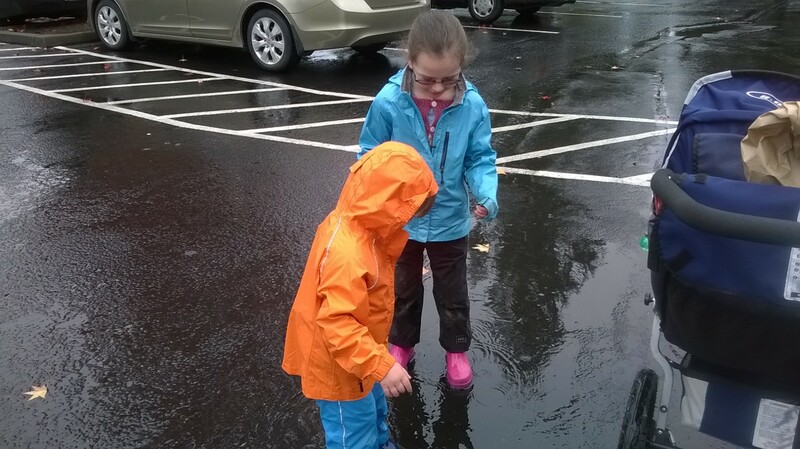 We headed home through the puddles in the parking lot. And here we are, back at our scary intersection. We cross, and head home.